The first outdoor living history exhibit you will encounter on your visit is the Wampanoag Homesite, located on the banks of the Eel River. Here you’ll discover how the 17th-century Wampanoag would have lived along the coast during the growing season; planting their crops, fishing and hunting, gathering wild herbs and berries for food, and reeds for making mats and baskets. You’ll see different kinds of homes including a mat-covered wetu, the Wampanoag word for house, and a bark-covered long house or nush wetu, meaning a house with three fire pits inside. 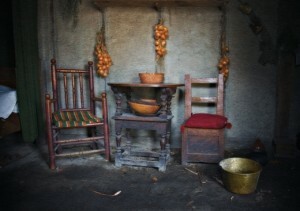 Food is cooked over an open fire using only the ingredients that were available in the 1600s. At the riverside you may see men making a mishoon – the Wampanoag word for boat – using fire as a tool to hollow out a tree. The staff in the Wampanoag Homesite are not role players. 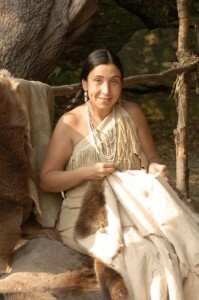 They are all Native People – either Wampanoag or from other Native Nations – and they will be dressed in historically accurate clothing, mostly made of deerskin. They speak from a modern perspective about Wampanoag history and culture. Is a re-creation of the small farming and maritime community built by the Pilgrims* along the shore of Plymouth Harbor. In the Village, the year is 1627, just seven years after the arrival of Mayflower. The Museum selected this year for re-creation because it is well-documented in the historical sources and shows the plantation (a word that was used interchangeably with the word “colony” in the 1600s) just before the colonists began to disperse beyond the walled town and into other parts of what would become southeastern Massachusetts. The English Village brings colonial Plymouth vividly to life. Here, you will find modest timber-framed houses furnished with reproductions of the types of objects that the Pilgrims owned, aromatic kitchen gardens, and heritage breeds livestock. Engaging townspeople are eager to tell you about their new lives in Plymouth Colony. Visiting the ship Mayflower II is an extraordinary experience. 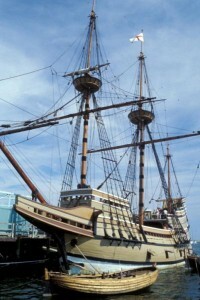 The original Mayflower that sailed to Plymouth in 1620 no longer exists. Plimoth Plantation’s full-scale reproduction, Mayflower II, was built in Devon, England and crossed the Atlantic in 1957.
solid oak timbers and tarred hemp rigging to the wood and horn lanterns and hand-colored maps, have been carefully re-created to give you a sense of what the original 17th-century vessel was like.